Russia was in the direst straits even before the Ukraine crisis erupted on a grand scale in 2014. The sanctions imposed after the annexation of Crimea have deterred investments still further and instigated capital flight. The oil price slump of late 2014 and the related collapse of the rouble have inflicted additional pain and boosted inflation. 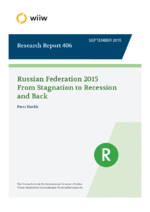 Assuming that the sanctions and oil prices remain at their current (mid-2015) levels, our baseline scenario sticks to an earlier forecast of a close to 4% drop in GDP in 2015, followed by weak recovery resulting from a gradual revival in government-sponsored investment and the sluggish launch of import substitution programmes. The latter, together with more state interventions and changing the pivot from the EU to the East, could provide a modest, yet unimpressive, stimulus to the economy. Nevertheless, the chances for a successful implementation of industrial policies aiming at the diversification of the economy are now even bleaker under the regime of sanctions than in the past, and the economic prospects are accordingly gloomy.